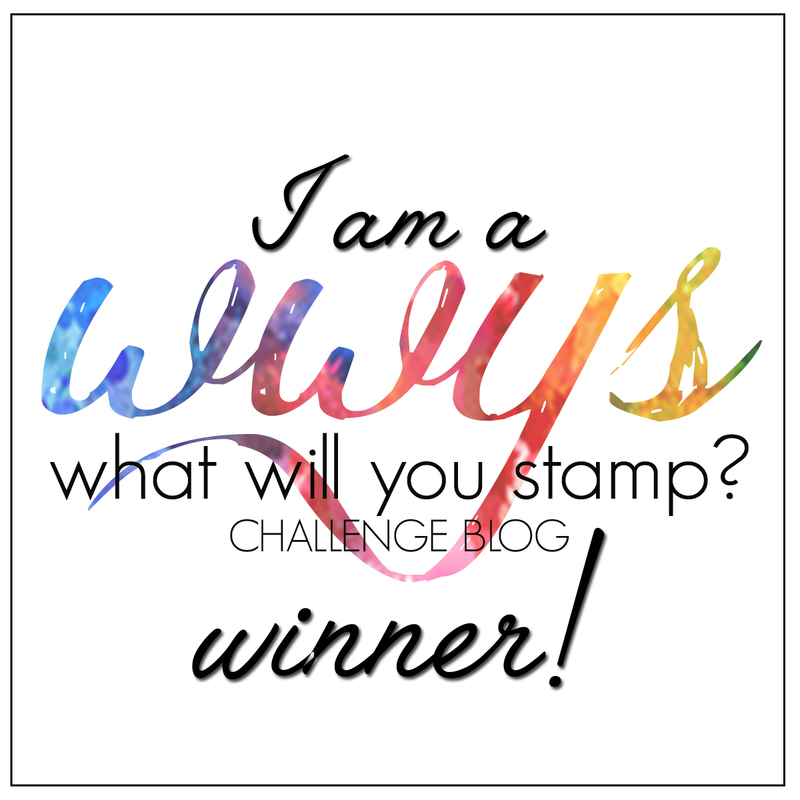 It's been a while since I've been organised enough to join in with a blog hop, but here we are! 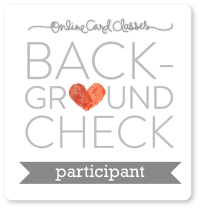 This time I'm joining a group of fabulous Stampin' Up Demonstrators who are part of Kylie Bertucci's Go For Greece Training Group. 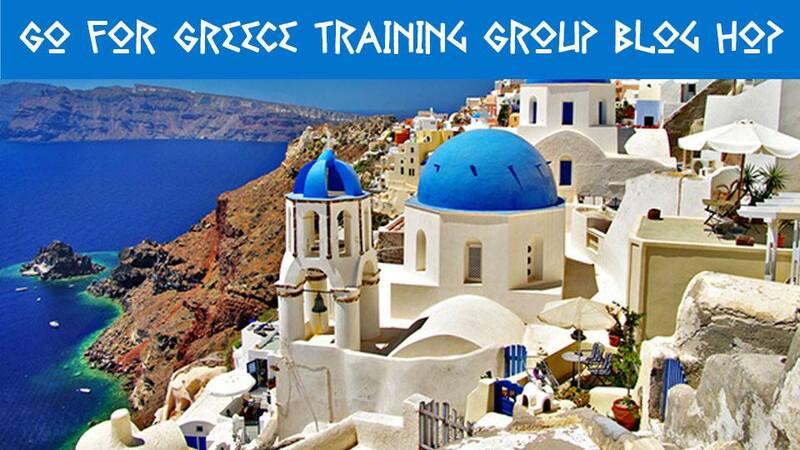 We are all working our businesses with the aim of achieving the 2019 incentive trip to Greece! Wouldn't that be awesome? I've never been to the Greek Isles and it's a photographer's dream location. Anyway, on to my project for the blog hop! For my card I wanted to create a sponged background over stamped and embossed images, where the images are left white. 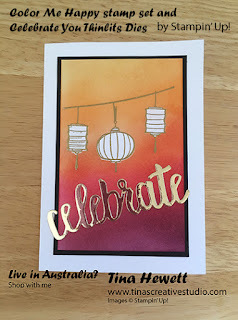 I used the Color Me Happy (144062 wood, 144069 clear) stamp set, stamping the lantern images in Versamark ink on a Whisper White panel. I then sprinkled gold embossing powder over the stamped images and heat embossed them with my heat tool. I created masks for the lanterns by stamping them onto post-it notes and cutting them out. The masks were placed over the top of the stamped images, and then I did the sponging over the top. I used So Saffron, Pumpkin Pie, Tangerine Tango, Real Red and Rich Razzleberry ink and sponged over in a rainbow, blending the colours as I went. Once I was happy with the results, I removed the masks. I then matted the panel onto Basic Black cardstock and adhered it to a card base of Thick Whisper White cardstock. 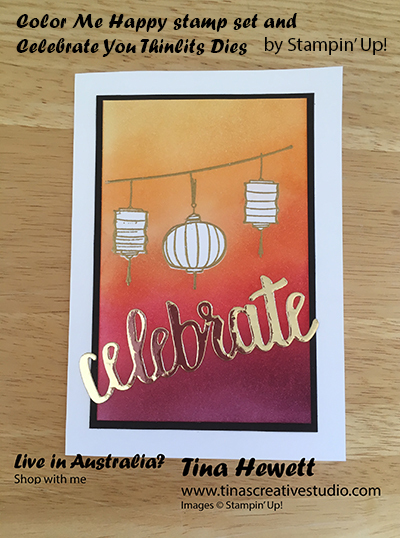 For the greeting I used the Celebrate You Thinlits Dies and Gold Foil cardstock. Before I die cut it I put a piece of Adhesive Sheet on the back so that after the word was cut I could just peel off the backing sheet and stick it to my card. Here's the supplies I used to make the card. If you need any of the supplies, just click on the link to go to my online shop.